This page has now been superseded by two new pages, part of Oliver's Cornwall Walking Pages. 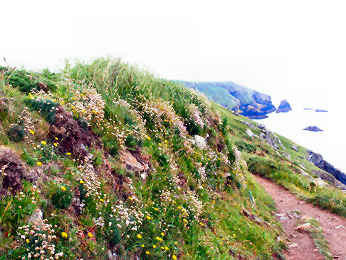 For a linear description, with GPS data, of the Cornish Coast Path please go to Oliver's Cornish Coast Path. 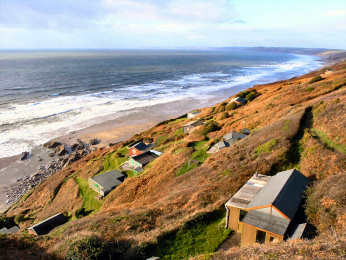 For a series of Round Walks from locations on the coast please go to Oliver's Coastal Round Walks. I have retained this page for a few features about locations along the south coast. These are listed and linked below. There is something special about the Lizard Peninsula, that great triangular projection below Helston. It boasts the locations from which Marconi made his most important experimental radio transmissions, modern Goonhilly Satellite Station, and a massive airbase from which air-sea rescue helicopters operate. Inland is flat farmland and heathland but the coast is another matter altogether. High cliffs, serpentine boulders, jagged offshore rocks, charming small fishing villages and coves and wonderful walking. 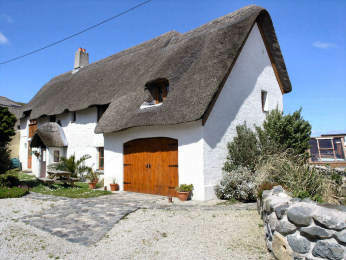 Best known of the coastal villages is Coverack but it is probably the least interesting. 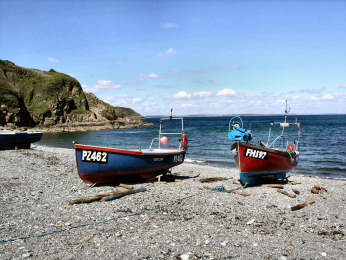 We prefer Cadgwith, Mullion and the strange Porthoustock. If you are a golfer, you could take the chance to play on Britain's most southerly mainland course at Poldhu Point by Mullion. 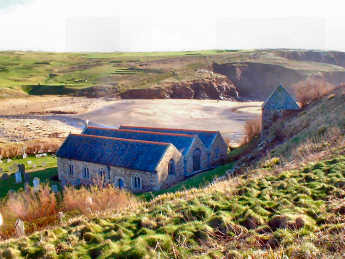 If you like unusually located churches, look at Gunwalloe Church Cove. If you are a serious diver, you would head for Porthkerris to dive around the Manacles, site of many a shipwreck. The coast path runs all the way around the peninsula and there is great walking to be had, some of the finest on the coastal part of the Lizard National Nature Reserve, between Mullion Cove and Lizard Point. The Reserve also takes in Goonhilly Downs and areas near St. Keverne. This is a delightful spot and one which causes not a litle confusion. Most people call The Loe Loe Pool but this is repetition. The Cornish word Loe is the same as the Irish Lough and the Scottish Loch, meaning a pool. And no one knows how the Bar formed, turning the estuary of the River Cober into a freshwater lagoon. Some say it was Atlantic storms, some claim longshore drift, some suggest silt from upstream mines. The likelihood is that it was a combination of all three. From a distance Loe Bar looks like sand but turns out to be mostly very fine gravel with a sprinkling of colourful small sea-washed stones. High seas can cover the bar. The quickest way to get here is to park on the south-west side of Porthleven, close to the cliffs, and take an easy ½ mile walk. But there are many alternatives: also a mere ½ mile away is a car park at Chyvarloe, off the road to Gunwalloe; 1½ miles away are car parks in Porthleven and at Penrose Hill and Degibna; and the free car park in Helston, just off the Porthleven road, is only about 3 miles. A National Trust leaflet on The Loe and Mount's Bay shows all these and maps and describes a delightful walk on the Penrose Estate, around the Loe and taking in the Bar. Classic Walks Cornwall, Vol 1, walk 13 also describes it. The Anson Memorial overlooks Loe Bar Park in Porthleven or at any of three National Trust car paeks. 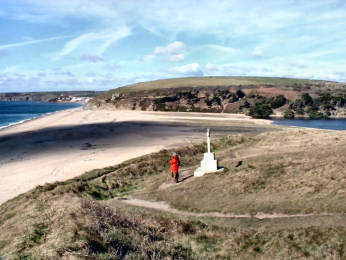 The Anson Memorial, on the south-east side of Loe Bar, commemorates the the 100 men who lost their lives in December 1807 when HMS Anson was wrecked on Loe Bar. The good thing that came of this disaster was that Helston man Henry Trengrouse was so affected by the loss of life that he devised a rocket apparatus to fire a line from shore to ship. 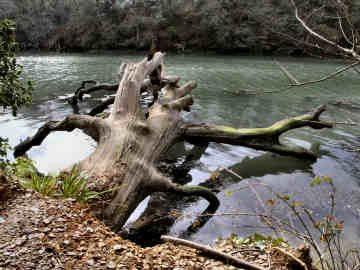 Tennyson's description in Idylls of the King, the Passing of Arthur is taken by some to suggest Loe Pool as the location where Sir Bedivere threw Ecalibur into the water. "On one side lay the ocean, and on one lay a great water". The less plausible alternative is Dozmary Pool on Bodmin Moor. The name, Gunwalloe Fishing Cove, distinguishes it from Gunwalloe Church Cove to the south, where the church of St. Winwalloe stands right by the beach, tucked into a cliff on a charming sheltered sandy cove. Gunwalloe Fishing Cove is a very different place. Although called a cove, there is little shelter here with cliffs on only two sides rather than three. 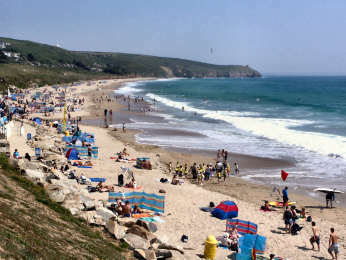 The beach stretches all the way to Porthleven and at first glance looks sandy; in fact it is a fine gravel, once used on Cornish driveways, and still used locally for concrete block making. 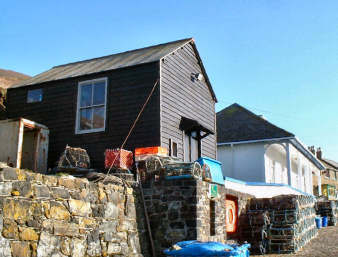 There was once a thriving pilchard fishery here, established in 1803 and, so it would seem, still operating in the 20th century. Ruined buildings stand on the cliff top, one a winch house, the other pilchard cellars. Four winches also stand on the cliff edge, one in use recently enough to have been driven by a petrol engine. 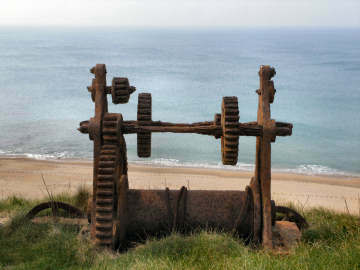 According to the National Trust's Loe Pool and Mount's Bay leaflet, these winches were used to draw the boats up the almost vertical cliff. The NT also describes the large ruined building as a pilchard store. To me, it looks to have been a dwelling, judging by the number of windows - though the seaward end looks as if it may have housed a processing plant of some sort. A fascinating and slightly puzzling spot. Follow a lane off the main Helston to Lizard road, through Gunwalloe, past the excellent Halzephron Inn and down to the coast, and you will come to Church Cove, set below Mullion Golf Course. 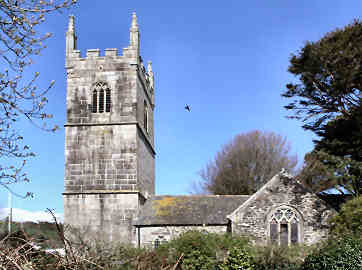 There the little church of St. Winwaloe is tucked into the foot of the dunes. Winwaloe was born in Brittany of Cornish parents in the sixth century. The present church is mostly in the perpendicular gothic style. Inside are two earlier fonts and tiny rood stairs are still in place. Two inner doors are painted with the figures of eight of the apostles. Beyond the south porch a tower looks defensive but is really a detached bell-tower. By the porch is a figure of St. Winwaloe, also associated with churches at St. Winnow, Towednack, Landewednack and Poundstock. In one corner of the churchyard is a Cornish cross. A lovely spot, mostly peaceful. 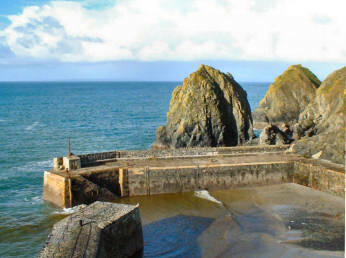 For a small harbour in the care of the National Trust, Mullion Cove disappoints. Neatly enough kept, few of the buildings are very interesting and, with enclosed harbour and high cliffs, there are no views and you get a somewhat oppressive feeling. To get any views you will need to climb to a hotel high above the north side; there is some parking here and in a quarry on the road down to the cove but there is none by the harbour. The harbour walls suffer badly from storms and, in 2007, the National Trust decided on a policy of 'managed retreat' which means that, in due course, they will no longer maintain the harbour walls which, like those at Trevaunance Cove on the north coast at St. Agnes, will eventually crumble. 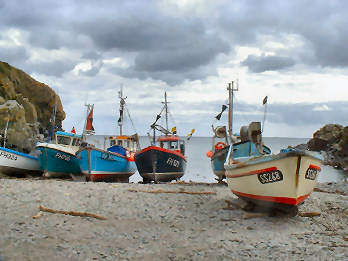 This must be just about the most photographable - and photographed - spot in Cornwall, and no wonder, it's ravishing and relatively peaceful, even on my visit, during a walk from Mullion to Lizard Town, on a fine Saturday in late June 2005. Kynans is Cornish for ravine and even down on the beach you still feel almost as if you are in a ravine, surrounded as you are by vast isolated rocks rising from the sand. The surrounding scenery is glorious. 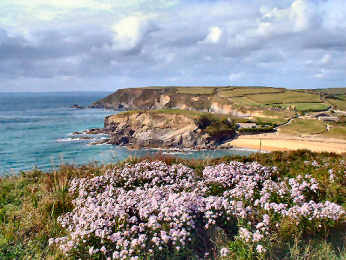 The cliffs to the north are part of the Lizard National Nature Reserve; to the south-west they are owned by the National Trust. The car park is out of sight on National Trust land. Down in the cove there are just a few privately owned homes and a good café where I enjoyed a cream tea. A stream tumbles down the ravine, past the cottages; just above it is an unusual seat, settle-like and apparently made from wood salvaged from a wreck. Because of the fairly steep descent from the car park, and the restricted parking space, the beach doesn't get too crowded. Sands are golden and firm but beware, at high tide there is no beach at all. To get to Kynance Cove, from the A394 Falmouth to Penzance at Helston, by Culdrose air base, take A3093 for Lizard, and turn right before Lizard Town. Kynance Cove at half-tide OS Explorer 103 and National Trust leaflet 14. Lizard National Nature Reserve is highly unusual as nature reserves go in that it is not one clearly defined area but a number of separate areas spread across the southern part of the Lizard peninsula. There is no cohesive pattern but a mix of heathland, grazing land, cliffs and beaches. Largest area is near the strange dishes of Goonhilly Earth Station, which has an exhibition about the reserve in its visitor centre. Goonhilly Down is open heathland, best from June when furze and many heaths and heathers bloom. Here you may see adders, lizards, buzzards and owls. 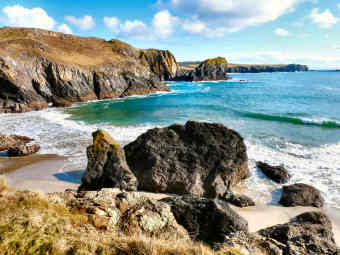 Next major area is the most exciting, along the west coast from Mullion Cove to Kynance Cove, along Mullion, Predannack and Kynance cliffs, its two parts linked by the National Trust's Predannack Estate. Many rare wild flowers abound: Cornish heath and bell heather, green winged and marsh orchids, short stemmed ox-eye daisies and wild asparagus. You may see peregrine falcons, ravens, choughs, skylarks and stonechats. A herd of Highland and other rare cattle graze the clifftops. Smaller areas include Kennack Sands - where there are red serpentine pebbles on the beach and, from time to time, basking sharks in the sea - and Main Dale, near St. Keverne, with its heath-spotted orchids and bog asphodel. This oddly named peninsula - Cornish 'lys arth' meaning 'high court' or 'als arth' meaning 'high cliffs' - juts into the Atlantic to the south of Helston and the Helford River. Lizard Point is the most southerly point on the British mainland. The coast is all jagged cliffs and picturesque coves. 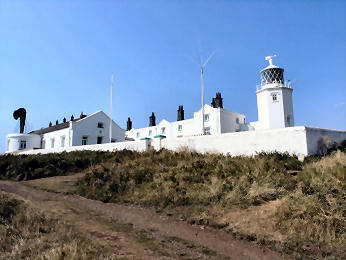 Inland is flat heath and farmland, dominated by the dishes of Goonhilly Earth Station, site of the first satellite communications between Britain and the USA, entirely appropriate since Marconi's first 200-mile transmission was from Lizard Point to the Isle of Wight, and his very first transatlantic signal was from nearby Poldhu Cove to Newfoundland. We walked from Lizard Town, with an NT leaflet and OS Explorer map. Our route took us west from Lizard Town, down a track and path to Caerthillian Cove, round the coast by Lizard Point and Bass Point to Landewednack Church Cove - a charming spot - and back up to Lizard Town on a quiet road past St. Winwalloe's church. Although Lizard Town is not a very preposessing place it does have several cafés. There is also one by the little car park between Lizard Point and the lighthouse. There is ample parking in Lizard Town. At our last visit this was still by voluntary contribution; shamefully, not all pay up. Ten miles from Helston, by narrow lanes, Helford is an awkward place to live unless you are a boat-owning second home owner, which much of Helford's population is. If you are a small-boat owner it's an ideal place with a boat club, pontoon and river anchorages and sheltered waters. Disadvantage is that you can't get much benefit from village anchorages as the tide leaves them high and dry for half the day. The National Trust owns the land on the east bank of Frenchman's Creek but Landmark Trust seems to own, and presumably rent out, the cottage in the woods at Frenchman's Pill. This is a secretive feeling place where trees grow right down to (and in) the creek and where dead trees litter the banks and rot in the mud. At low tide there is little water in the creek, at high tide the water is eerily still. An atmospheric place. 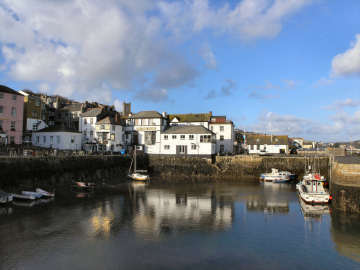 Like so many of Cornwall's attractive small villages by the water, St. Anthony-in-Meneage (the word probably means Monk's land) is second-home territory for small boat people. Gillan Creek pretty well dries up at low tide so there is little anchorage; instead boats are pulled up on the hard. Next to the church is Lantinning Farm so Anthony may well be a corruption of Intenyn, perhaps the founder of the original small monastic settlement here. There are traces of the Norman period in the church but it was largely rebuilt in the 15th century. Inside are rood stairs, a nicely carved 15th century font, a 15th century German carving of the Last Supper, carved bosses on the wagon roof and a holy water stoup in the porch. Outside is a much degraded Cornish cross and, in the graveyard extension, a tiny stone well-housing. This needs a feat of memory. 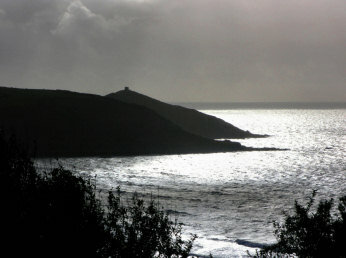 Although I write in late 2005, Jane and I actually did the walk before we had even moved to Cornwall. We had arrived at noon and checked-in to Falmouth's Greenbank Hotel. We set off to look for somewhere for an evening meal - shod only in light shoes - and just kept walking. Through the town to the docks, round Pendennis Point and along the town beaches - Castle and Gyllingvase - then on the coast path to Swanpool beach and on to Maenporth beach. After turning back, by now in twilight, we stopped for coffee in the Three Mackerel (changed name since) above Swanpool beach. By the time we got back into town we had walked a totally unexpected 8 miles and our feet were sore from our entirely unsuitable footwear. All we were fit for was a light fish supper before we headed back to our hotel. If you are walking the coast path, for a largely urban walk this is much more interesting than you might expect. There is usually activity on the beaches and you have the chance to visit Tudor Pendennis Castle and the superb Maritime Museum. To continue on the coast path you then walk though narrow but partly pedestrianised streets on the way to Prince of Wales Pier. There you take the ferry to St. Mawes and another ferry across to Place.